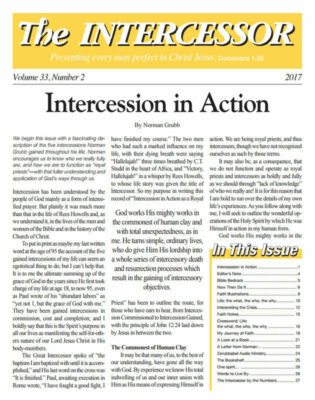 We begin this issue with a fascinating description of the five intercessions Norman Grubb gained throughout his life. Norman encourages us to know who we really fully are, and how we are to function … continue reading. C.T. Studd, founder of the Heart of Africa Mission (later the Worldwide Evangelization Crusade), wrote many songs and poems throughout his years as a missionary. This poem we are printing was written … continue reading. We continue our excerpts from Page Prewitt's booklet, copies of which are available in our online store. Satan Was Our Boss We enter life with our human spirit joined to the spirit of error, or … continue reading. Continuing on from last issue, we conclude this two part excerpt from Once Caught, No Escape where Norman Grubb describes the revelation that came out of a personal crisis of faith. Part Two Now … continue reading. BOOK REVIEW: "Life: The What, The Who, The Why" By Page Prewitt Driven by the heartbreak of her continued inability to live a godly Christian life, Page Prewitt was "convicted to labor, search, … continue reading. Phyllis my dear, Your letter has followed down to me on this tour. You know I always like to exchange letters with you. You are such a plain searcher and digger, and you share your searchings with … continue reading. I was born in Bugbrooke, Northampton, England in 1946, a year after the end of World War II. During my early childhood, shortages and hardships were still around. We lived in a small rented house … continue reading. "For assuredly, I say to you, whoever says to this mountain, 'Be removed and be cast into the sea,' and does not doubt in his heart, but believes that those things he says will be done, he will have … continue reading. You hear the words "faith" and "believe" casually used these days. In the news and general conversation we hear terms like "people of faith" and admonitions to "keep the faith." Even among Christians, … continue reading. Sign up for weekly passages from Scripture and other resources. The purpose of Zerubbabel Press is to further the great high calling of the Lord Jesus to carry His Gospel to the whole world. This calling is known in the Christian world as the Great Commission. Our interpretation of the Gospel is that Jesus Christ was the second member of the Trinity, fully God, made manifest in the flesh. He was tempted in all points as we are, but totally without sin. He was crucified for the sins of the world, was buried, and rose from the dead on the third day, according to the Scriptures. He gives the power to become the sons of God to all who receive Him. 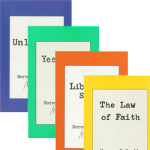 Our online store offers books, audiotapes, and CDs which present the biblical doctrine of our union with Christ. Help support Zerubbabel Ministries. To make a donation click the 'DONATE NOW' button below. Thank you for your contribution to our ministry. Words to Live by is a weekly devotional email of Scriptures and quotes that highlight and expound upon our Union with Christ. If you'd like to receive devotionals like the one below, please subscribe using this link. “How thankful I was when, as a young missionary, longing to be ... continue reading.